I’ve been designing, prototyping and deploying new ad formats in digital advertising for more than 15 years. I started one of the first rich media advertising companies, where we pioneered many of the ad formats that today are standard offerings – starting in late 1997. And I ran a team at Microsoft that focused on building new ad unit prototypes for emerging media for several years, which created hundreds of prototypes that were shown to dozens of brands and creative agencies for feedback, and we ran many studies. I tell you all this not to toot my own horn, but to explain that when I suggest that I’m going to propose a new ad format for the mobile industry, I’m not doing so idly. I’ve been doing this professionally for my entire career, and the problem of putting new ad formats on devices is one that I’ve thought an awful lot about. In fact, the format I’m going to suggest is very similar to one I proposed for another new device that was an innovative music and media player. But I’ll hold off on the specifics for a bit. The biggest problem with mobile advertising today is the ad formats being deployed. The screen is very small, and even a very small ad unit that isn’t well integrated into the screen experience of an app or mobile website causes a dissonance that is simply unacceptable to most users. And app developers see this clearly – using the presence of ads not really to drive ad revenue, but rather to annoy the crap out of consumers in order to push them to pay for the premium version of an app. This is a very backwards approach to advertising experience, but one that has been used repeatedly over the course of digital evolution. Ad experience design is a very tricky problem – because ad experiences need to walk the razor’s edge between grabbing the audience’s attention while not pushing them over into frustration. For this reason, in many ways, ad experience design is far harder than standard user experience design for applications. Unfortunately the vast majority of startups and even large companies that deploy apps and mobile sites simply slap tiny mobile banners onto their applications, and wait for the dollars to roll in. That isn’t likely to happen for most companies, because the ad experience is horrible. So I decided that instead of simply complaining about the ad experience of mobile, I’d propose to the industry through this article a new ad format that I believe will fix the core problems with mobile ads. I hope somebody picks it up and runs with it, because I firmly believe (after many years of thinking about these problems) that it’s the right solution for mobile. And I believe the same principles behind the format I’m suggesting would work well for tablets. Let me start by saying something perhaps a little controversial – it’s impossible for companies to differentiate from each other by using proprietary ad formats. Note that all rich media companies offer essentially the same ad formats. And this is one reason I’m not bullish on the current so-called “native ad format” movement. Unless you’ve got the reach of Google, Twitter or Facebook, rolling your own ad format is stupid. Advertising’s core principle is about reach – advertisers try to reach as broad an audience as possible that matches their target customer persona. Creative teams can’t cost effectively create unique ad formats for every publisher. This means that once a proprietary format starts getting scale, other companies copy that format and they begin to perpetuate. But we’ve only seen this happen with “native” formats when the company that created the format had large scale. So all paid search ads pivot off Google’s format, because the same creative needs to be uniform across search engines. And when formats that were pioneered by one rich media company got traction, every other rich media company adopted those formats too. Ad formats don’t work as product differentiators. First: The format must be integrated into the design of the application (app or web). App and M-Web developers must build their user experience *around* the ad vehicle. So the ad vehicle can’t be crappy – it needs to fit neatly into a standard App experience. It needs to provide utility to the advertiser (enable attention to be captured, and ideally to drive activity) and it needs to nestle carefully into the utility of the application it sits in. Second: The screen is small, so the ad needs to use the whole screen. Interstitial advertising has been around since the early days of the web – Unicast promoted the format broadly with its Superstitial format, which then was copied by all the other companies. But most of us who use mobile apps will probably agree that a straightforward interstitial experience is incredibly disruptive and annoying. So putting up a full screen ad that a user has to stare at before accessing their content is simply unacceptable. What’s the answer? Way back in 2006 I wrote an article that discussed the (then) current trend toward trying to drop short 5 second videos at the end of pods of content on television to combat fast forwarding on DVRs. We did some research back at the time at Microsoft that showed that consumers got annoyed with advertising content about 5 seconds into the roll of a video. We surmised at the time that for non-video content, a few seconds of static “sponsorship text” would be a good way to introduce pre-roll videos – that placing a short sponsorship message in front of the ads would soften the transition – especially if it was limited to a couple of seconds. We’ve seen this deployed to great effect at Hulu. I believe the answer is simple: Create a multi-part ad format that has different stages and experiences. First it’s a full screen ad unit with basic sponsorship text: This app is proudly sponsored by “insert advertiser name here.” Maybe the company logo can go on this screen as well. At the bottom of the full screen sponsorship, in small text, a message states: To see more, swipe the ad. Then the full screen unit should shrink down to a “leave-behind” banner that needs to be persistent, needs to be small, and needs to be “swipeable”. The leave-behind needs to take up the entire bottom of the screen – from left-to-right side. 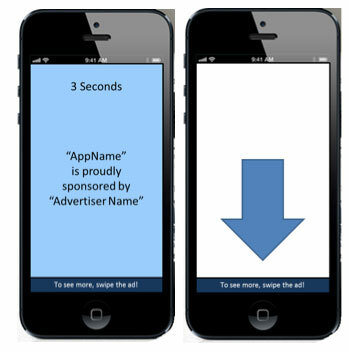 The creative content in this banner may not take up the entire screen width, but can be centered in the ad unit ‘space’ and ideally the background color of the ad should be matched by the background on the two edges of the ad unit (this is technically easy to do in apps) such that it doesn’t ‘hover’ in the middle of the screen. It’s also important that the same is done with the first and second interstitials – they should cover the whole screen, and be centered in the screen – not locked “off center” to the upper left-hand corner. The banner should have no more than three to five message transitions (animation points) that can tell an enticing message to the user to facilitate them swiping the ad. That should be followed by a short “swipe here” animation that is instructional for users to see that they need to swipe the ad to open a bigger ad experience. Upon swiping the ad unit, a full-screen ad should expand out of the banner unit that is fully interactive and immersive. This can be a “mini-game” experience, a video, an interactive unit that enables commerce or opting into something (a Facebook Like, tweeting a message to your friends, etc). It should not open a mobile web browsing experience that bounces the user out of the App experience, because once a user is trained that doing anything in the ad is going to bounce them away from their game, they’ll never interact with another ad. For Apps that have natural transition points (e.g. Moving from level-to-level in a game, or similar), the ad unit can expand out for no more than 5 seconds, and if the user chooses to interact with it – can stay up until the user closes it. The ad transitions are extremely important to get right. The initial interstitial unit should smoothly slide down off the screen leaving the banner unit there. The expansion of the banner to take over the whole screen also should be extremely smooth and feel “well crafted” to the audience. Also the initial interstitial should only be shown once per session to avoid annoying the audience. This won’t preclude multiple ads or advertisers per session – but will create scarcity and value to the session sponsor. The other critical issue here is transition timing. The initial ad experience needs to be no more than 3 seconds. The animation frames of the leave-behind banner need to last no more than 7 to 10 seconds. Any automated expansion of the ad unit should leave the expanded page up for no more than 5 seconds. I believe that if this ad unit were deployed uniformly across apps and mobile web experiences, the industry would see CPMs increase significantly, and the mobile advertising space could enjoy an interesting renaissance. I’m sure there are other answers to this problem – other formats for instance – that would work equally well, or even better. But if the industry doesn’t lock to a standard format quickly – I fear that the space will continue to languish and won’t see the growth it deserves. As I said above, ad formats don’t work as product differentiators. But the largest players do have the ability to use their reach as a driver of format adoption – which is good for the industry. Apple, Google and Microsoft should work together here to drive adoption of a great uniform ad unit that can work across mobile devices. Follow Eric Picard (@ericpicard) on Twitter. Why Do Web Pages Load So Slowly In A Broadband World?